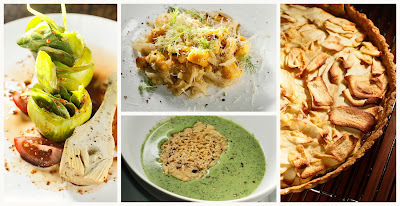 When a person even mentions a recipe or dish, I lock in on it and have to try it, too. Within seconds of meeting someone, I find that the conversation almost always turns to food. I love to ask questions and gain inspiration from passionate, everyday cooking. This is what gave me the idea to make a Spanish tortilla. At a photo shoot recently, I started asking people what they were making for dinner. A student told me that she was making a tortilla. 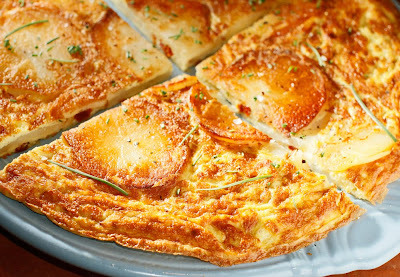 I'd had some delicious versions of this potato-and-egg dish in the past. So as I drove home in a terrible storm, all I could think about was what I would put in my own version of a Spanish tortilla. My favorite new ingredient is smoked sun-dried tomatoes. I found some locally at Fresh Market for about $4.00 a pouch. They taste very bacon-y, sweet, and savory. I just knew they would be perfect here. How would you use smoked sun-dried tomatoes? Preheat oven to 350 degrees. Heat a 10-inch skillet over high heat until it starts to smoke. Add a few tablespoons of olive oil and add potatoes (dry slices with a towel for a crispier potato) in a single layer on the bottom of the skillet. Turn off the heat on the skillet, cover, and set aside. The heat from the skillet will sear the outside of the potato, and the residual heat will cook them through. Mix the next four ingredients and pour mixture over the potatoes. Top with salt, pepper, and goat cheese. Place the skillet in the oven for 15-20 minutes or until the center is set. Turn tortilla over on to a serving plate so that the potato side is up. Serve tortilla hot or room temperature. 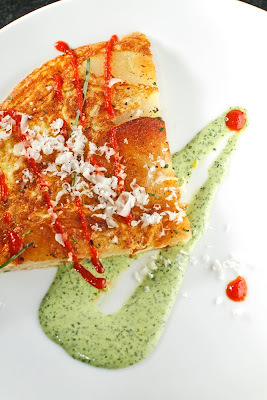 Garnish each slice with a bit more cheese, garlic chives, herbed aioli, and sriracha. Blend all ingredients until smooth. You will have some left over to use on sandwiches, wraps, or other things you want to yummify. With all of the nice weather we've been having lately, I've got sandwiches on the brain. To me, they're just the perfect food: tasty, filling, portable, and full of endless possibilities. I have to tell you that it's delicious and simple to make, and with spring just around the bend, it's a good excuse to bust out your grill for the first time this season. Using a food processor, blend the black beans, garlic, chipotle powder, and lime juice together until this forms a thick paste. Brush both sides of the sweet potato and the zucchini with olive oil, sprinkle both sides with ancho chili powder and salt. Preheat your grill. 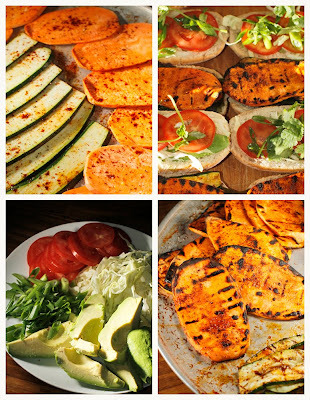 Grill sweet potato and zucchini for 3-5 minutes per side. Warm buns so they are nice and crispy on the outside. Slice buns in half and pull out the excess bread from the top half of the bun. (This creates a chamber that will make for a neater sandwich.) 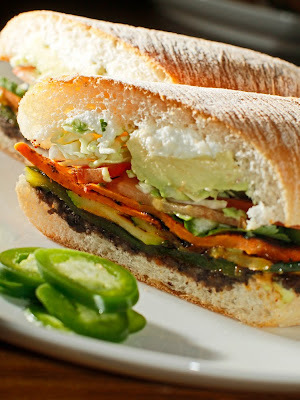 Starting at the bottom, spread black beans on the bun, top with roasted poblano, zucchini, sweet potato, cilantro, green onion, tomato slices, cabbage, avocado, hot sauce, cheese, and mayo. I'm no good with rejection, but I persisted because I knew I had a good idea. So I simply kept trying. I would walk up to the deli counter at various grocery stores with a bag full of portobello mushrooms and discreetly ask if they would slice them up like lunch meat for me. "I don't think we're supposed to do that," I would hear. "It's just gonna tear them up," was another common sentiment. Finally, I discovered an approach that worked. I let a few George Washingtons do the talking for me, and I let my partner in crime know that I would buy the mushrooms even if trying to run them through the slicer tore them up. It always worked out just fine. Yes! 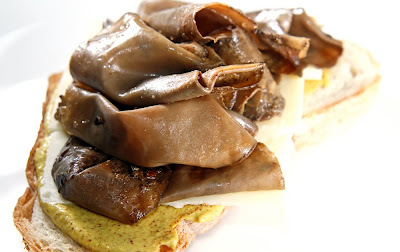 Once you have successfully obtained your medium-thin sliced mushrooms in any way you see fit, you are well on your way to a new world of lunch-y deliciousness. It is best to make a bunch of these slices and use them for sandwiches throughout the week. This recipe made enough for about 5 sandwiches for today's park picnic for 20+ folks; people who like pickles and this amazing stout mustard seemed pleased. Plus you have the scraps of the mushrooms left over for use in a tomato sauce or carbonara. Preheat your oven to 350 degrees. Whisk the first 7 ingredients together until incorporated. Stack mushroom slices into an oven-safe dish and drizzle a little of the dressing between every other layer. Pour remaining dressing over the top of the stacks. Cover with aluminum foil and bake for 1 hour. Allow mushrooms to cool throughly before placing them into a covered container and placing in the fridge. The flavor is very meaty and the texture is perfect. 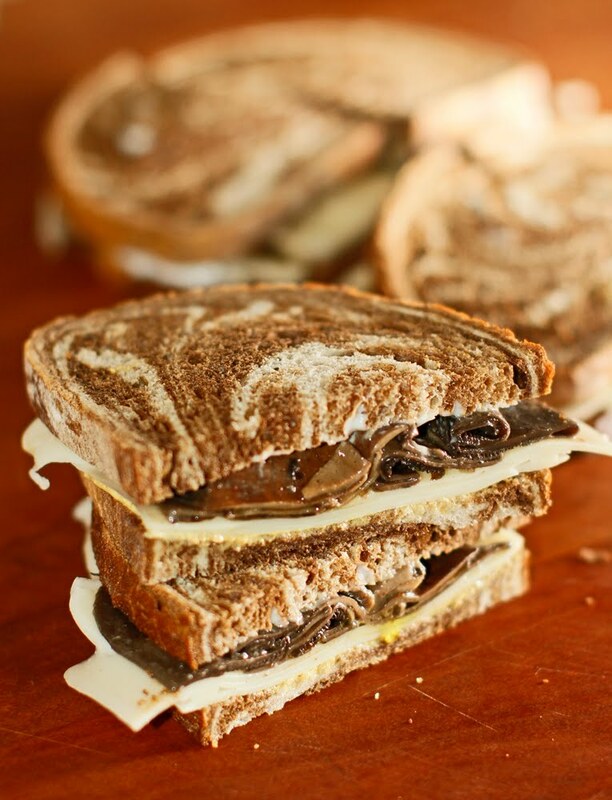 This slices are great for lunch on rye bread with mustard and swiss. They would also make a fantastic reuben. This recipe tastes so much better and is much better for you than the typical processed meat substitute slices. This is something you should try today. I was planning on making chocolate panna cotta. Wait, no...I actually thought dessert would be a soufflé. Or was it going to be a strawberry pie? 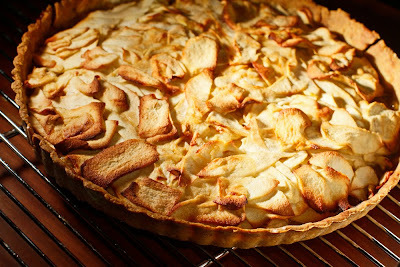 So how in the world did we end up making a simple apple tart for our Valentine's Day dessert? Well, we had already tried a blood orange-campari-caramel chocolate bar and then went and scarfed some cinnamon jelly beans (of all things), so simplicity won out in the end. That and the fact that the supposed strawberry compote in the freezer was really beet broth led us to throw together this super-simple, no cinnamon apple tart. Place the dry ingredients into a food processor and blend until pistachios are throughly broken down. While the processor is still running add the oil. Add the cold water one tablespoon at a time until the dough comes together into a ball. Cover and rest dough in the fridge for at least thirty minutes. 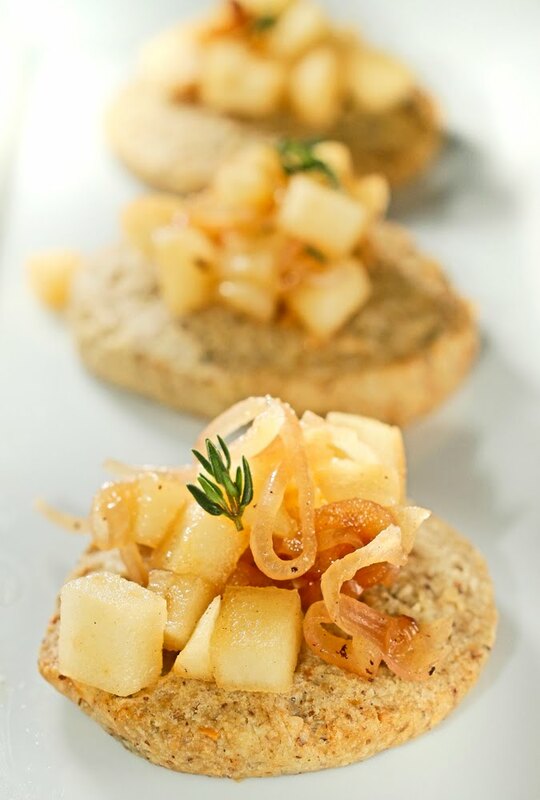 Using a mandoline or food processor, slice apples very thin. Toss apples with remaining (very few!) ingredients. Roll out and press crust into a tart pan. Par-bake the crust for 8 minutes, and then fill the crust with the apples; press them down with your palm. 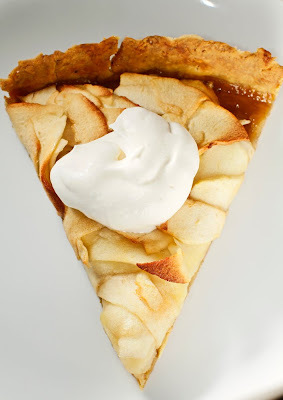 Bake for another 30-45 minutes until crust is crisp and the top later of apple has browned. Serve with vanilla-vodka whipped cream. *The key to a tasty tart is to use really good tasting apples. We used organic Granny Smith but this would be great with Pink Lady as well. 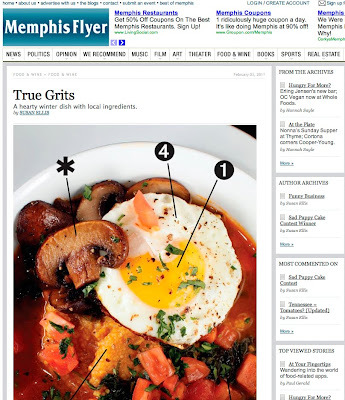 The watercress in this recipe came from Mary Phillips of Urban Farms here in Memphis. Urban Farms' mission is simple: improve everyone's access to healthy food. They have taken 3 acres of overgrown land in the center of the city and turned it into a working farm that's open to the public. The community is invited to come and learn about the farming process. Urban Farms produces enough food to support their own market, a C.S.A. program, and they also provide much of what is served at 3 Angels Diner on Broad. They are always looking for volunteers. Go to the Urban Farms website for more information. Blanch the watercress in boiling, super-salty water for one minute. Add all ingredients to a food processor and blend until smooth. Add a little water to gain the proper thick-but-not-too-thick consistency. 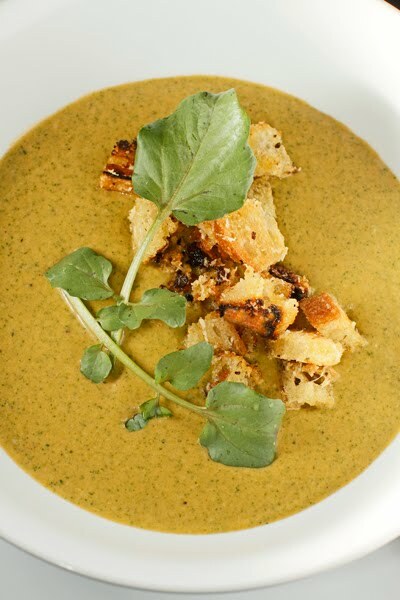 Serve with crunchy croutons and a little grated parmesan. Sometimes it feels like a boring chore to eat a typical salad. All of that spearing and crunching and getting the right mix of ingredients into one bite is tiresome, not to mention how long it takes to finish eating your typical salad. How old-fashioned! We sought a new kind of salad, one that made the salad-eater feel super cool and way ahead of the curve...on the salad vanguard, if you will. Here is our invention: the handheld salad. Never mind that a spring roll was similar and, well, invented first -- this is something different. Maybe we'll never have a mess of outdated salad in a bowl or plate again! Lie the raddichio leaves down like a cup. 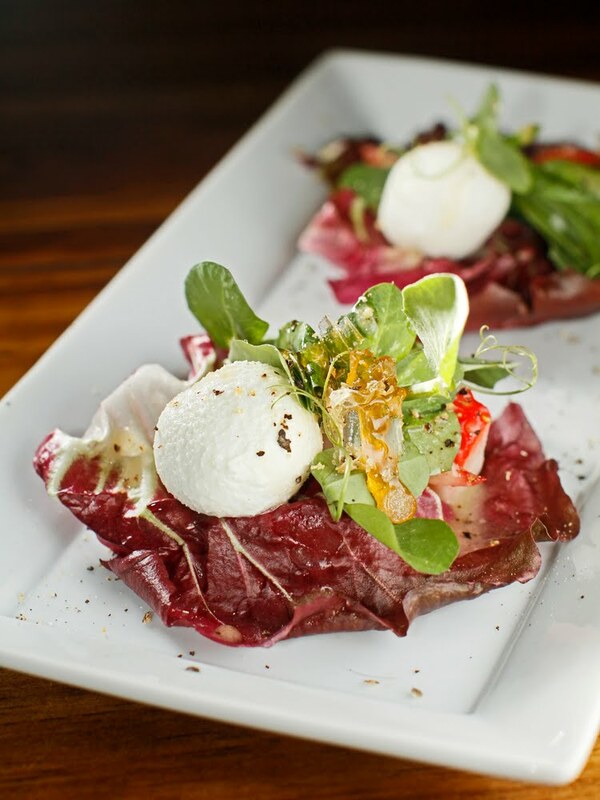 Fill each up with pea shoots, strawberries, goat cheese balls, and top with a piece of honeycomb. Whisk the dressing up and spoon it over the handhelds. Season with salt and pepper and eat carefully. 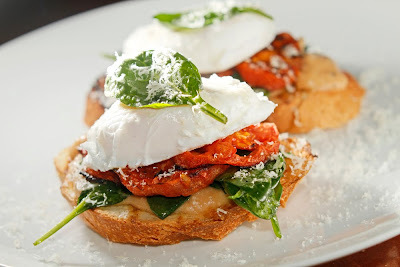 What are the possibilities for vegetarian brunch? For me, the key is thinking about the classics and then giving them a twist. Here I have taken a few cues from eggs sardou, a nod to the classic benedict, and then turned the whole thing it on its head. 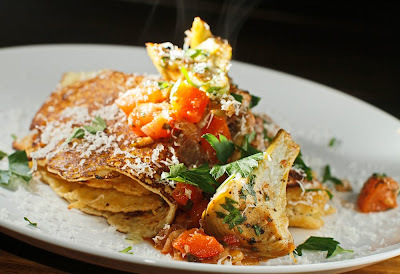 I switched out some ingredients and flavors to create an Italian-inspired version of those brunch mainstays. Imagine a grilled slice of rustic bread topped with creamy white beans, garlicky spinach, smoky tomatoes, and a perfectly cooked egg. It makes me wish it was Sunday morning right now. Peel tomatoes and slice into 1/2 inch slices. Arrange slices on a baking sheet. Sprinkle each with a little smoked salt, a little sugar, and then drizzle the top with olive oil. Place under the broiler for about 8-10 minutes or until the top of the tomato begins to blacken. Set aside to cool. Heat a large frying pan over medium heat. Add three tablespoons of olive oil. Once the oil begins to smoke, throw the garlic into the pan and remove pan from the heat. The garlic will continue to cook in the hot oil. Once the garlic is toasted, pour in a few tablespoons of water to stop the cooking. Toss the spinach in the warm dressing until it wilts. Season with salt and pepper. Place all ingredients except the olive oil, salt, and pepper into a food processor and blend until ingredients are broken down. Add enough olive oil to loosen the consistency and blend until smooth. Season with salt and pepper. 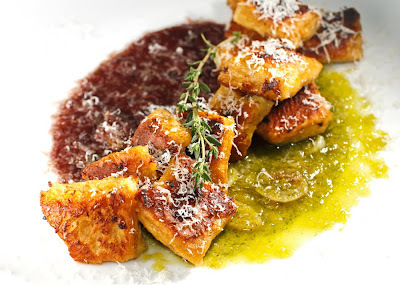 In a cast-iron grill pan, grill slices of Italian bread that have been brushed with olive oil. Once the bread is toasted, spread white-bean purée on to each slice. 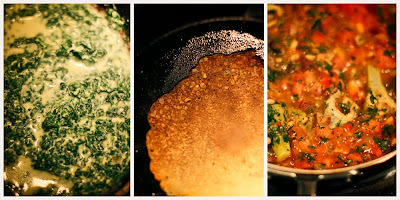 Top that with spinach, oven-dried tomatoes, and an egg cooked to your liking. Garnish with parmesan cheese. I was asked recently to cater a party, and I just might do it. The invitation got me thinking: what kind of party food would I serve if I were to accept the challenge? A million thoughts flooded my brain. I could do empanadas, tarts, sliders, stuffed mushrooms, or I could do little shots of soup, sushi, spring rolls, 10 kinds of hummus. Once I was able to calm down, I decided to take it one dish at a time. I remembered these blue cheese and walnut crackers I had made years ago. The richness of the blue cheese is wonderful. But what do you put on a cracker that already has cheese in it? I always love the combination of apples, walnuts and blue cheese, so I decided to experiment a little. I love how these came out. Here is how I topped my homemade crackers. I've tried to be more free in the kitchen lately. I'll start cooking with no particular dish in mind, and I just decide to see what happens as I go. That is how this wonderful and unusual dish came about. I spotted the fennel in the fridge, took it out, and began slicing it. The fennel slices made their way into the pan just as I took notice of a cara cara orange with its neon flesh. 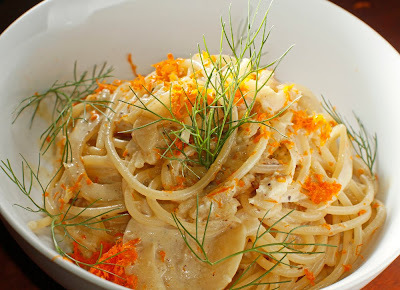 I love the flavor of fennel and orange, so I went with it. 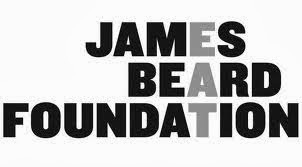 It's a liberating and creative way to approach a meal. No planning, no shopping. I call it stream-of-conciousness cooking: take the ingredients around you and forge them into a dish. Sometimes it doesn't work out perfectly, but this time it did. I think I'll definitely make this dish again. Heat olive oil over medium heat in a medium frying pan. Add the fennel and allow it to cook undisturbed until the bottom layer begins to brown (about 6-10 minutes). Stir and cook for another 4-5 minutes. Raise the heat and add most of the zest (reserve 1/4 of it for garnish, though!) and wine. Reduce until most of the liquid has evaporated and the fennel is soft. Turn the heat to low and add the milk, honey, garlic, thyme. Temper the egg and add it to the mixture. Toss cooked pasta in the sauce. Divide between two plates and garnish with orange zest and fennel fronds. I have been pining after a doughnut pan for about a year now. It seemed so unnecessary, but I had to have one. There are so many doughnuts we like, but these from Seattle and these from Memphis (also these!) take up about twenty-five percent of my thoughts on some days. How to procure them and how I can make them myself are the running topics in my brain. I finally got my pan, and today I made my first batch. 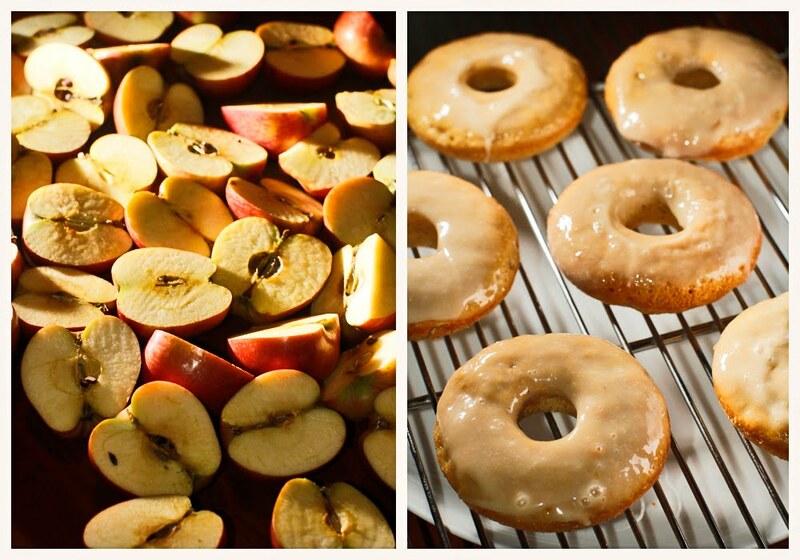 It's about as easy as making muffins, but it looks like a bigger deal to end up with real doughnuts in the end. I've seen a lot of apple cider doughnuts lately, so I juiced a bunch of free apples, made my own apple butter, and went to work. Put all of the ingredients in a saucepan on medium-high heat. Stir so that nothing burns and the liquid is dispersed. Let the mixture cool for a bit and then smash it up with a potato masher or blend. Set aside. Preheat oven to 325 degrees and brush the doughnut pan with canola oil. Whisk the dry ingredients and add the wet ingredients. Mix well. Spoon into pan but do not fill to the top. Bake for 12-15 minutes. Set aside to cool. Whisk the 4 ingredients together in a bowl. Dip the doughnuts, once cooled, in the glaze and place them on a baking rack so that glaze sets without pooling. I needed some way to know for sure who is gonna win the Super Bowl. I have very few allegiances in the sports world, but this game is super-important to my buddy Aaron, who is a rabid Steelers fan. The outcome will likely predict his mood for the entire month of February (and maybe a bit of March). There is only one sure way to predict the winner. I made two sauces: a black olive and white wine reduction (for the Steelers), and a green herb oil (for the other team). I poured each onto the plate at the same rate and watched to see which sauce took most of the surface area of the plate. It was an exciting contest with plenty of touch-and-go moments. Both sauces gave it 110%, and when it was over, they left it all on the plate. I'm happy to report that the black olive sauce won handily over the green herb oil in the end. 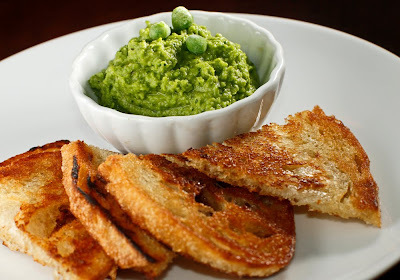 Our sister-in-law makes green pea hummus for lots of get-togethers. 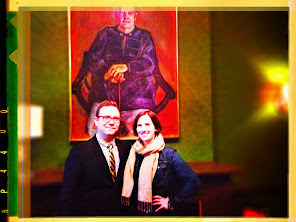 It is so addictive that we had to give it a shot, too! It's different from regular hummus (such as this or this) because it has both a sweetness and a brightness that really shine. Pour the olive oil in a skillet over medium heat. Add the spices; toast until fragrant. Add the garlic in thick slices. Cook this for a minute -- watch the garlic because you for sure do not want to burn it! Defrost the green peas by putting them in a bowl and microwaving them for a minute. Now this stuff and everything else goes in the food processor. Pulse until all peas are thoroughly broken down and it is a regular-hummus-like consistency. Serve with olive-oil-fried toast (thin slices of baguette pan-fried in a little olive oil), whole wheat tortillas, or pita. *So...what are you going to make to go along with the big game on Sunday? 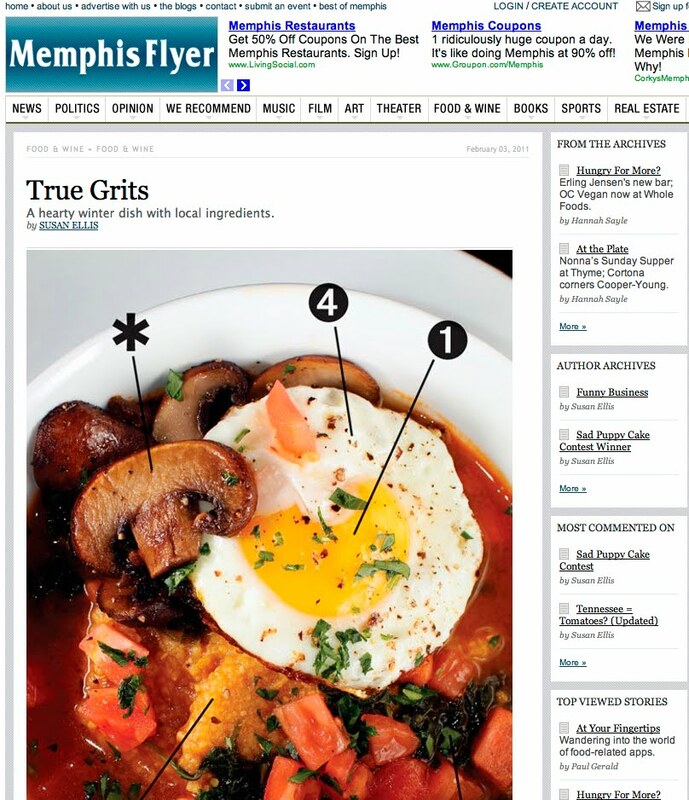 The Memphis Flyer's Susan Ellis and I put together a local recipe feature we call True Grits. It's the tale of how you can incorporate local ingredients into your dinner tonight. Susan talks with local farmers and producers about their products and where you can find them. I put all of the ingredients together into a delicious and comforting Southern classic. 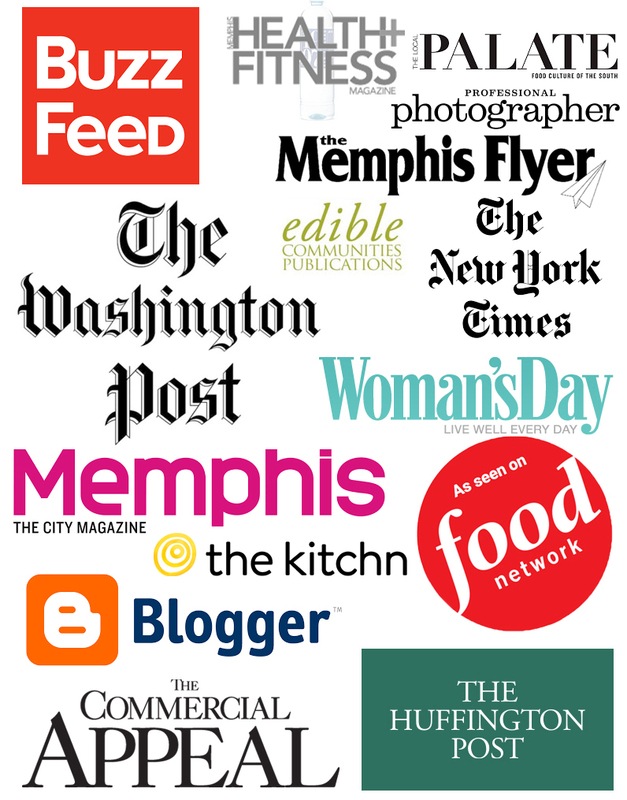 Click HERE to read the story, and then click HERE for the recipe that is posted on Susan blog, Hungry Memphis. I know what you are having for dinner tonight. Socca may be my new favorite food. It is so fast and simple to make, it's healthy, it's packed with flavor, and it's as versatile as pasta. So, what the heck is socca? It's a crepe or pancake made from garbanzo bean flour. It's found in Italy and France where it is typically eaten plain as a snack. I just couldn't help but to dress mine up for dinner. I'm already dreaming of a million ways to eat socca. What will you do with it? Mix all ingredients with a whisk so there are no lumps. Batter should be thinner than pancake batter. Set mixture aside for at least 10 minutes. Heat a cast-iron skillet on medium heat. Using a silicone pastry brush, coat the surface of the skillet with about a teaspoon of olive oil. Pour about 1/4 cup of batter into the skillet and keep your eye on it. Once the surface appears dry (about 2 minutes), use a metal spatula to flip it. Allow it to cook for another 2 minutes. Repeat until all batter has been used. Blanch arugula in super-salty water for a few seconds. Rinse and squeeze out any excess water. In a medium skillet over medium heat, sauté garlic in a tablespoon of olive oil until toasted. Add the blanched arugula, egg, cheese, and about 2 tablespoons of water or milk. Mix vigorously until the egg has cooked through. Add salt and pepper to taste. Remove from the heat and set aside.